Saying Iron Maiden's original vinyl issues sound better than their 1998 CD remasters would be an understatement. 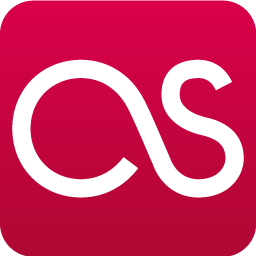 Even chock full of dust, these records emit a glorious, uncompressed racket, and each instrument breathes as it should, sounding positively organic. Seeking out these worn but charming first pressings isn't necessarily a bad idea; in fact, it's just about the greatest thing one can do as a budding heavy metal vinyl enthusiast. From my collection, Piece of Mind, Powerslave, and Live After Death are my favorite examples of Martin Birch's dexterous production work, a quality the remasters sadly tend to mask. While all three records were found pre-owned, I can't speak highly enough of their warmth and openness, even with minor crackles and, in Powerslave's case, a scratch on one side that reveals the fragility of the medium. Being a double album, Live After Death is a gatefold, while the other two are the tried-and-true slipcases that nearly all 12" vinyl call home. Especially neat is Powerslave--its textured, almost cracked-looking cover is far from the norm, which is quite tough to capture on photograph. 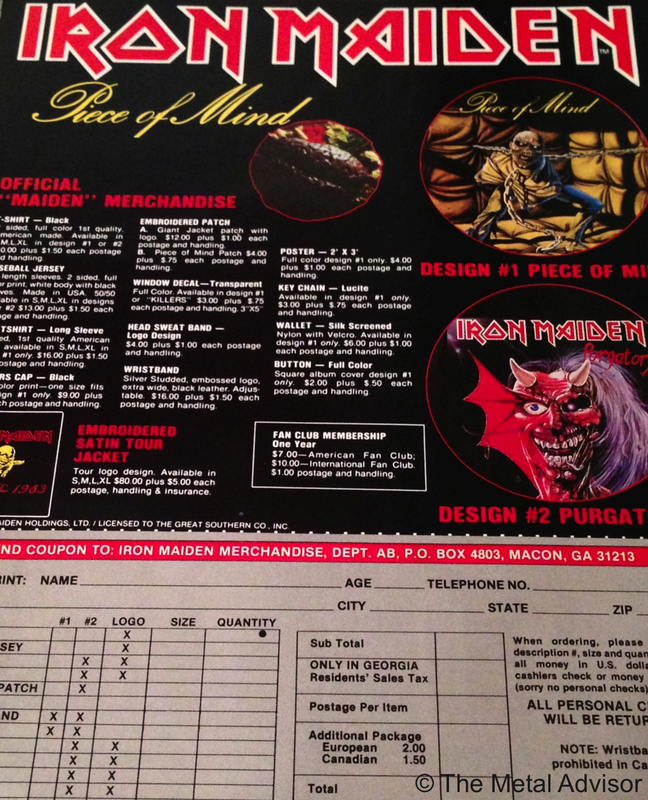 Piece of Mind is closer to standard fare, but the release's inner sleeve showcases a young Iron Maiden, with a clever play on the album's title (check out that brain served up on a platter! 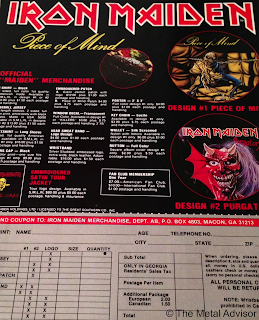 ), as well as an order form for vintage merchandise. All three were released by a division of EMI, making the trio plentiful, though good examples command a healthy wad of cash. If you're not overly concerned with sound quality, and don't mind a few hissy pops, your money is best spent on well-used copies. There's a reason these records are played to death--the music is excellent and from smack dab in the middle of Maiden's golden years. When found at the right price, each release is practically a no-brainer. Live After Death is perhaps the definitive Iron Maiden live album, Powerslave is relentless all the way through, and Piece of Mind proudly introduces McBrain to the line-up. Don't get me started on the cover art, either. Derek Riggs is a genius.